Runners start the 'Run To Honor' 5K run in honor of Police Week. 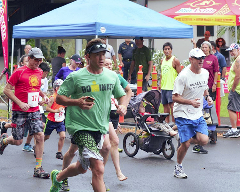 At Liliʻuokalani Gardens in Hilo on Saturday morning (May 17), 105 adults participated in the “Run To Honor” 5K Run, 66 adults participated in the 2 Mile Walk and 45 children participated in the “Click It or Ticket” Keiki Fun Run. 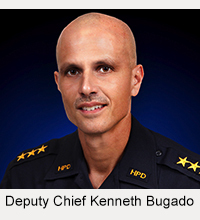 The event was held in recognition of Police Week, which honors the memory of officers who gave the ultimate sacrifice, and to promote crime prevention through the use of Crime Stoppers. This family event also included food, entertainment, informational and activity booths, prizes, a water slide and more. Organizers plan to make this an annual event. 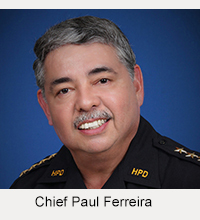 Proceeds from adult entry fees will go to establish a Crime Stoppers/Police scholarship for Criminal Justice majors at Hawaiʻi Community College. Children participated without charge. First, second and third place winners in each age category of the 5K run are listed below.